Enjoy a private charter fishing trip with family and Hillsboro friends! The captain and first mate will have all the gear ready; all you have to do is reel in the big ones! Refreshments and snacks will be provided on board. At the end of your trip be sure to bring your catch back and the chefs will prepare it for your next meal any way you prefer. All trips will depart from Hillsboro Dock. Please arrive 15 minutes prior to schedule departure. Morning | Depart 8:15 a.m. and return for lunch. Afternoon | Depart at 12:45 p.m. and return by 5:00 p.m.
Daily half-day excursions leave plenty of time for other activities at the Club. Charters are scheduled so all meals may be enjoyed at Club. Plan a fun day out on the water with family and friends! 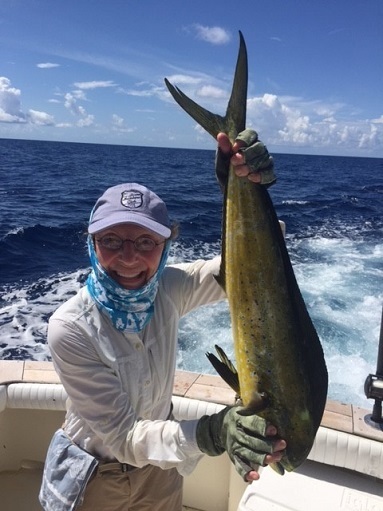 South Florida boasts some of the best deep sea fishing for swordfish, sailfish, grouper, mahi-mahi, marlin, tuna, and wahoo right off our coastline! Charters can be arranged at any time throughout the season!